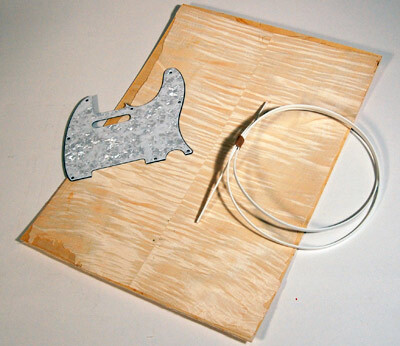 I really had my heart set on adding an edge binding to my grizzly telecaster kit. 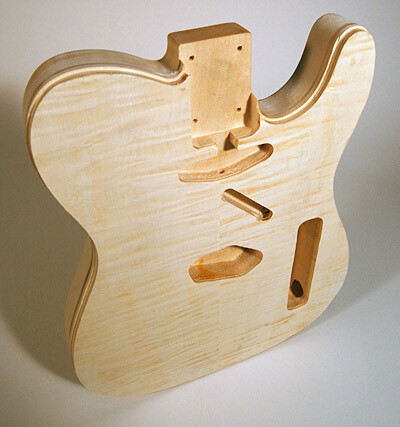 The problem is that the guitar body comes supplied with the edges pre-sanded and rounded off to a 1/4″ radius. This curvature was too much to allow for installation of even the thickest edge binding that I could find, so I had my father run the body through his thickness planer, taking 1/8th inch off the top, and restoring the square edge. 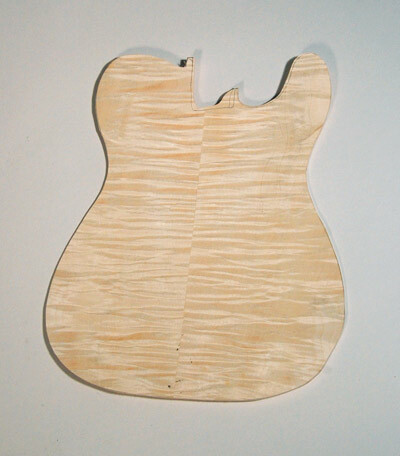 To build the body thickness back up to where it was, I laminated a piece of 1/8″ birch plywood to the top. 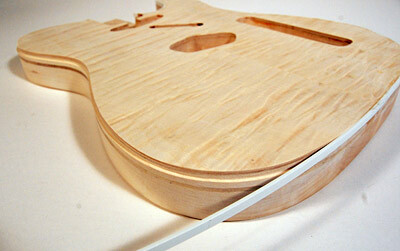 Before cutting out the plywood, I added a veneer of book matched flame maple to the birch. Grizzly sells this veneer for $9.50. 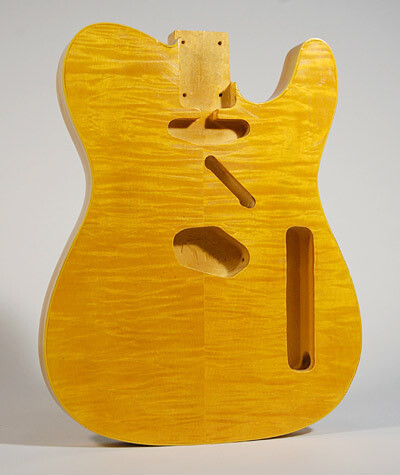 If you hanker for flame maple but don’t want the extra work, Grizzly sells an “heirloom” version of the Telecaster kit which comes with a flame maple top for an additional $150.00, but I hadn’t really planned on flame maple, I just needed to add wood so I figured why not flame ?. In addition to the edge binding, I also wanted a mother-of-toilet-seat pick guard, so I picked one up on ebay to replace the white one that comes with the kit. I ordered a strip of edge binding and rattle-cans of vintage amber, cherry red, and clear nitrocellulose lacquer from Stewart Macdonald. 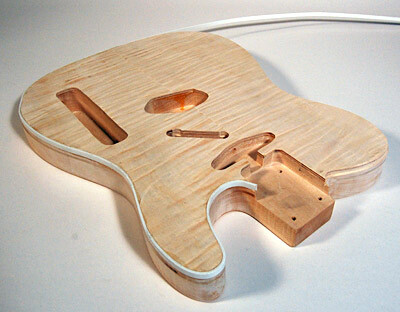 I cut out the guitar top on the band saw and glued it to the body. 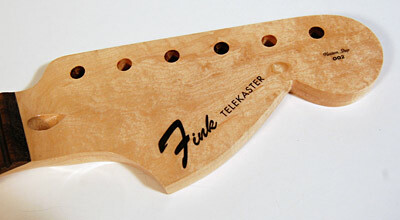 Using a router with a flush trim bit, I opened up the pickup and control pockets, and trimmed the outer edge flush. With an improvised 1/8″ rabbeting bit, I routed a channel for binding around the edge of the body. I roughed up the binding, then installed it using thick CA glue and an accelerant, working from one end to the other. It took lots and lots of hand sanding to level out the binding around the edge. Much of the sanding was to remove a nasty groove that I inflicted to the outside edge of the body when I routed the binding channel. I didn’t have the right rabbet bit, so I took the bearing off of my flush trim bit. I gound down the nut that used to hold the bearing on, to form the right size bushng for ther depth of cut that I wanted. Well, that home made bushing did quite a number on outside of the body. but hey, it got the job done that night instead of next week! 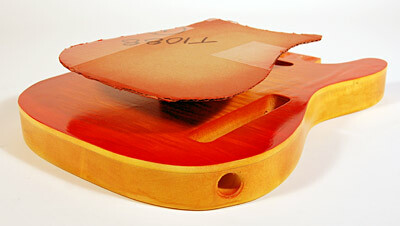 I masked off the binding before shooting the body with the vintage amber lacquer. 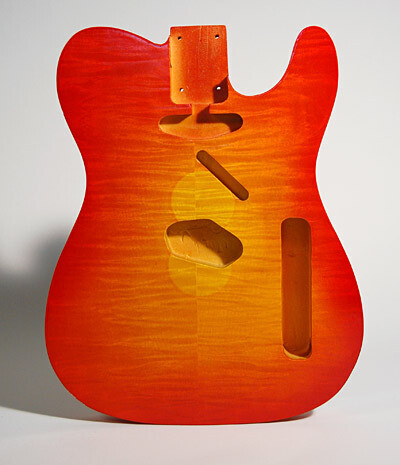 To achieve the red to amber gradient, I made a cardboard mask, and elevated it about 3″ above the guitar. Spray from the center, toward the edge of the mask and the over spray will create a smooth sunburst. If you want a harder edge, or faster transition to the burst effect, lower the height of the mask. I could have done mine a little lower. Spray the red or whatever color you are using on the back and sides in the same manner. Peel the masking from the edge binding and scrape any seepage away. I applied about 5 or 6 layers of clear lacquer on top of the color coats. 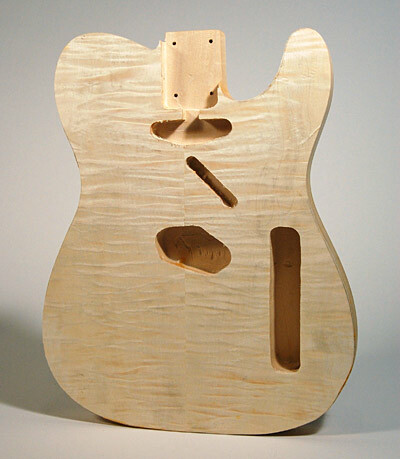 Just keep clear-coating until you cant see any grain lines in the finish. 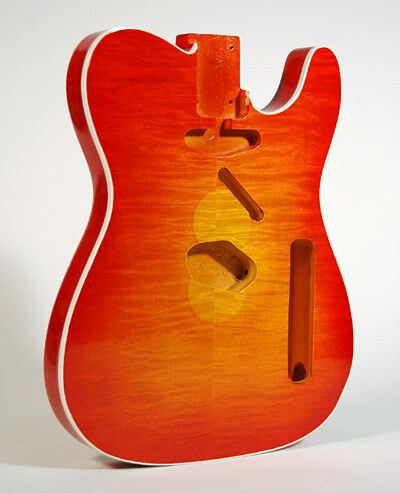 This type of lacquer needs to cure for at least 4 weeks before polishing can begin. I guess I’ll just bang away on my $79 plywood dreadnought acoustic ’til then. 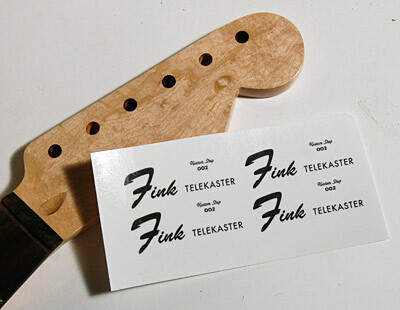 I just discovered that Testors sells blank sheets of water slide decal paper that are designed to be run through an inkjet printer, so I printed up some decals for the peg head. Next update: Wet-sanding, polishing, assembly, set-up, and of course, Smoke On The Water. This entry was posted on Tuesday, April 7th, 2009 at 10:08 pm	and is filed under Guitar, Reviews. You can follow any responses to this entry through the RSS 2.0 feed. Both comments and pings are currently closed.